Important for travellers in Denmark! 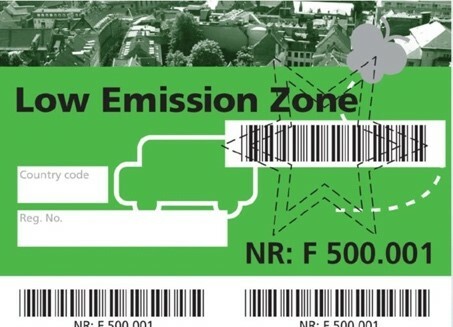 Since 2011, the Danish regulations concerning access to so-called “Miljøzonen” (Green Zones) also apply to foreign vehicles. Access to the Green Zones is restricted for freight vehicles with a permissible gross mass of 3.5 t and more. Planning is ongoing regarding the creation of Green Zones that will be accessed only by vehicles with a special Eco-Sticker attached to the windscreen in and around almost all major cities in Denmark. The Green Zones cover industrial zones, ideal and wide centres and outskirts of cities depending on the specific area and the decisions of the respective city administration. Entry into a Green Zone is indicated by the sign shown on the left. How to buy your Eco-Sticker for access to Green Zones in Denmark? TECHNOTEST JSC issues Eco-Stickers for Denmark after reviewing documents and sending an electronic application to the relevant offices in Denmark. The procedure takes up to two business weeks. Each ECO-STICKER contains the number of the registration plate of the vehicle, for which it is issued and may be used for intended purpose only. All freight vehicles of categories EURO 4 and EURO 5 meet the requirements for obtaining an Eco-Sticker. For freight vehicles of categories EURO 3 and below, a request may also be made after proving the installation of an approved dust particles filter. The validity of the sticker starts from the moment of its adhesion to the lower left corner of the vehicle’s windscreen and has no end date. Because the vehicle registration plate number is printed on the sticker, in case of re-registration of the vehicle or changing of the windscreen, the sticker needs to be re-issued. In cases where EURO category is not mentioned in the card, it is advisable to provide a copy of an EURO-category certificate or other document certifying the classification of the vehicle in a particular environmental category such as: CEMT – ECMT Certificate issued by the manufacturer or their authorized representative – Green Certificate (reports of periodic inspections are not accepted), COP or other certificate by the manufacturer or their authorized representative – in English or German language. If such a document is not presented, there is a risk of issuing a lower-level Eco-Sticker. In cases where EURO category is not mentioned in the card, it is advisable to provide a copy of a EURO-category certificate or other document certifying the classification of the vehicle in a particular environmental category.